( fl 1444–69). Netherlandish painter, active in France. 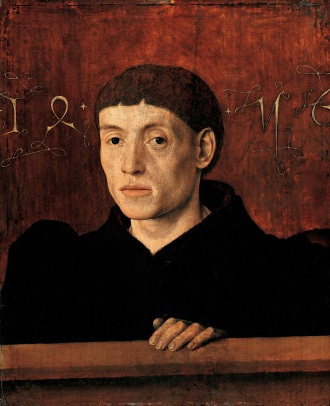 The son of Ydria Exters ‘d’Allemagne’ (d 1460) and the stepson of Pierre du Billant, he is first recorded on 19 February 1444 as a witness with Enguerrand Quarton in Aix-en-Provence and described as ‘magister Bartolomeus de Ayck pictor’, inhabitant of Aix. From c. 1447 he was ‘peintre et varlet de chambre’ at the court of Rene I, King of Naples (reg 1438–42) and Duke of Anjou (reg 1434–80). Between 1447 and 1449 Barthelemy worked at Rene’s chateau of Tarascon (Bouches-du-Rhone) in a room close to the Duke’s own apartments. There his activities may have included supervising fellow artists, providing designs and perhaps painting the ceiling decoration of the Royal Apartments in the east wing of the chateau (de Merindol). In 1451 Barthélemy travelled in the Duke’s entourage to Guyenne, and in 1456 he was at Angers, which he visited on a number of other occasions. Existing accounts show that Barthelemy was responsible for paying painters and illuminators, purchasing materials for manuscripts and obtaining gold to be made into jewellery for Rene’s second wife, Joanna of Laval. The last document relating to Barthelemy is dated 26 December 1469, when he received wages for himself, three servants and three horses. The high esteem in which he was held may be deduced from Jean Pelerin’s third edition of his treatise De artificiali perspectiva (Toul, 1521), which ends with a French poem mentioning a ‘Berthelemi’ together with Jean Fouquet, Jean Poyet and Coppin Delf. 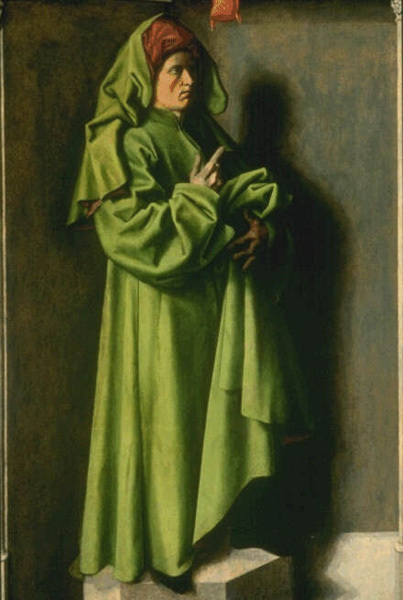 There are attempts to identify Barthelemy d'Eyck with the Master of the Aix Annunciation. ( fl 1442–5). Painter active in France. He is named after a panel of the Annunciation (Aix-en-Provence, Ste Marie-Madeleine; see fig.). 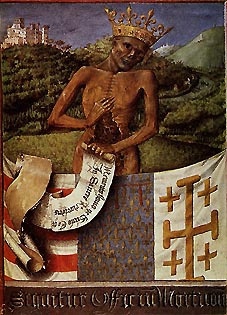 The painting has been connected with a series of wills executed on behalf of the draper Pierre Corpici (b ?1388; d before ?1465), an inhabitant of Aix. In the earliest surviving will, dated 9 December 1442, known only from a copy made by Henri Requin (Labande), Corpici expressed a wish to be buried in Aix Cathedral and bequeathed 100 florins to pay for an altarpiece depicting the Annunciation or the Virgin Annunciate. The painting was to have a supercelo (crowning panel) and a scabelo (predella) and bear both the Corpici arms and the sign of his shop. 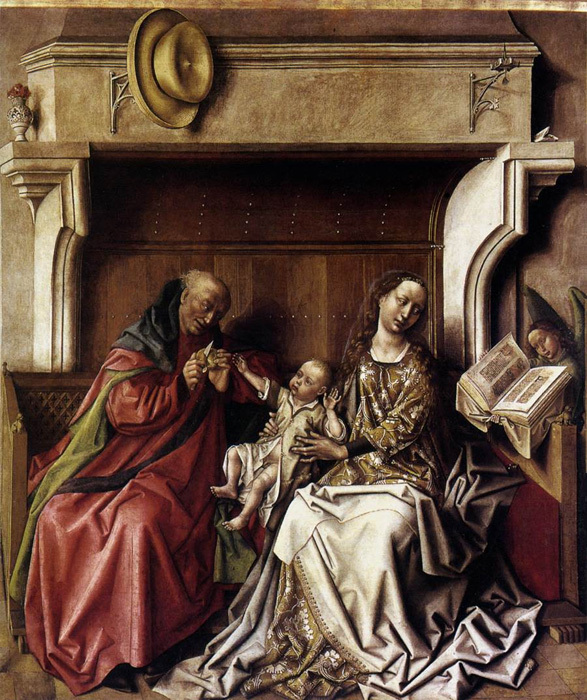 Although not a contract, the will is quite specific regarding the subject-matter of the altarpiece. There is no mention, however, of it being a triptych with wings nor of the name of the artist who was to execute the work. On 5 January 1443, Corpici was granted permission by the cathedral chapter to construct an altar (destr. 1618), which was located to the right of the entrance of the west choir (built c. 1285–c. 1425). 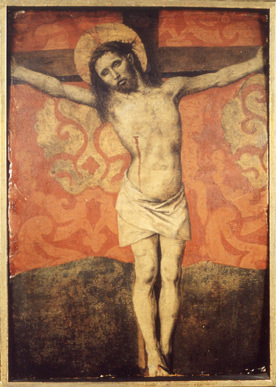 A further will of 14 July 1445 reiterates Corpici’s desire to be buried in the cathedral; no reference is made to the altarpiece in this document, suggesting it was completed by this date. Further wills of 13 February 1449, 19 April 1458 and a final one of 8 November 1465 refer to the ‘altar of the Annunciation’, indicating that the altarpiece was installed by then. It has been suggested that the Aix Annunciation was originally a triptych, with Isaiah (Rotterdam, Mus. 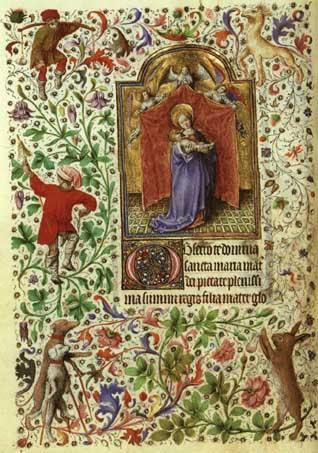 Boymans–van Beuningen) as the left wing, with St Mary Magdalene Kneeling on the reverse, and Jeremiah (Brussels, Mus. A. Anc.) as the right wing, with Christ on the reverse; a Still-Life with Books (Amsterdam, Rijksmus.) was originally at the top of the Isaiah panel. The association of these lateral panels has been disputed (Hochstetler-Meyer). By 1551 the Annunciation seems to have lost its crowning panel and predella, and in 1618 it was moved from the Corpici altar to the Espagnet family altar in the cathedral baptistery; it was transferred to the sacristy of Ste Marie-Madeleine between 1791 and 1818. 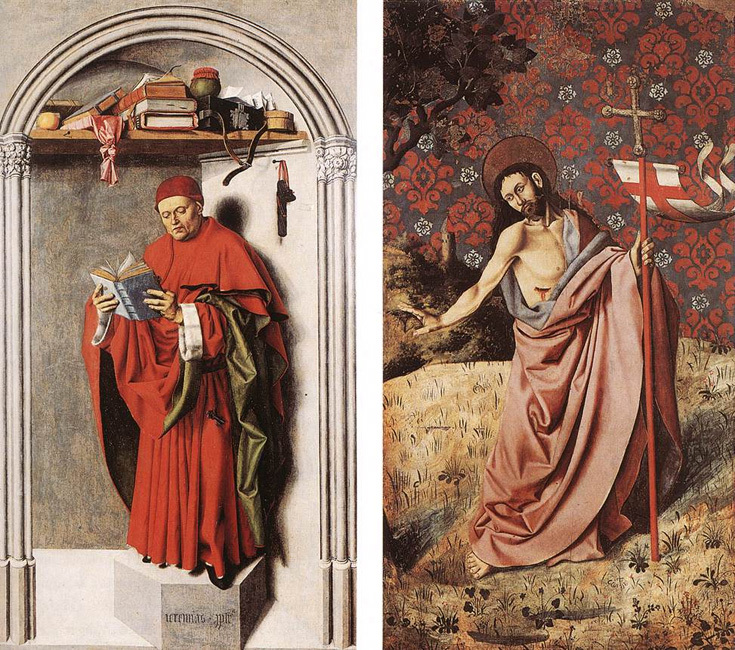 Numerous attempts have been made to identify the artist of the Annunciation or determine his nationality. An early attribution was to the Neapolitan Niccolo Colantonio on the basis of the resemblance to his St Jerome in his Study Removing a Thorn from the Lion’s Paw (Naples, Capodimonte), but this has long since been discounted. 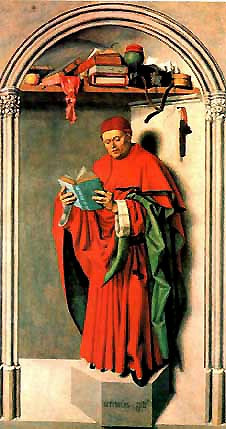 The painter of the Annunciation was a near contemporary of the Master of Flemalle, Jan van Eyck, Stephan Lochner, Konrad Witz and Lukas Moser, and the painting bears a stylistic relationship with the work of these artists, for example with Witz’s SS Catherine and Mary Magdalene in a Church (Strasbourg, Mus. 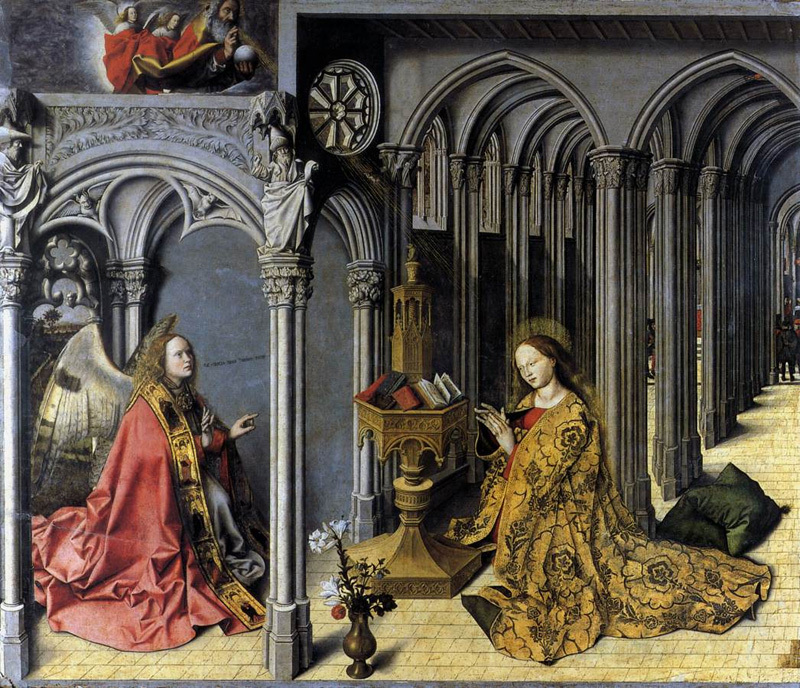 Oeuvre Notre Dame) and with the Annunciation (Madrid, Prado) attributed to the Master of Flemalle, although whether the relationship is due to direct influence or common prototypes is unclear. Comparisons have also been drawn with the work of the sculptor Claus Sluter, for example his Weepers from the tomb of Philip the Bold (Dijon, Mus. B.-A.) have been compared with the Prophet panels. The Annunciation is stylistically conservative, and the diversity of theories as to its origins is the result of its eclectic character. Whether the painter was Netherlandish, Burgundian, Provençal or from further afield is a matter of conjecture. He has been tentatively identified with several artists including the Provençal Jean Chapus and three Flemish artists active in Provence: Guillaume Dombet, Arnoul de Cats [Arnolet de Catz] ( fl 1430–35) and BARTHELEMY D’EYCK.